So, these toys called fidget spinners are the latest craze. Everybody who can get one has one (except me). I’ve never played with one – never actually seen one – but I have seen articles and advertisements for them all over the place. From what I’ve read, once you start playing with a spinner, you can’t stop. Fidget spinners get you hooked because they’re mesmerizing. They have three prongs, or arms with weights, or bearings, that are attached to a central core. The arms rotate when you hold onto the center. As I understand it, when you twirl the toy, the arms spin and become a blur. Some of the spinners also light up. Hypnotic. These gadgets purport to have some health benefits. They claim to relieve stress and help people focus. However, the jury is out on the health and safety of fidget spinners. Recent articles have highlighted some of the drawbacks of these popular products. In fact, the opposite may be true. 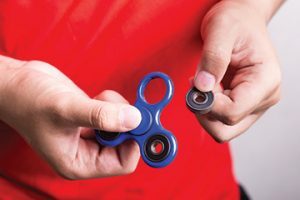 Some schools are even banning fidget spinners because they’re seen as a distraction. 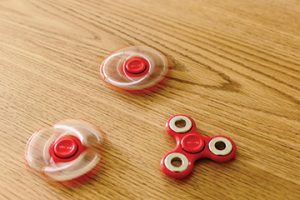 For example, a rule that disallowed students from bringing spinners to school was implemented at a number of facilities in the Dublin City School District outside Columbus, Ohio. There are some physical health risks as well. Earlier this year in Texas and Oregon, there were incidents of children choking on small parts that broke off these gadgets. These cases prompted groups such as the Toy Association, the Good Housekeeping Institute and the Consumer Product Safety Commission (CPSC) to issue statements and recommendations on the safe use of these toys. Apparently, what’s causing the choking hazard are small parts of the toys, including the bearings, that can come off and be swallowed by young children. Also potentially dangerous are the small batteries that come in the light-up spinners. If the battery compartments are not appropriately closed off, the batteries can fall out, and children can swallow those as well. The CPSC is investigating the incidents in Texas and Oregon. They also issued an advisory to parents telling them to “keep fidget spinners away from young children because they can choke on small parts.” They added that parents should warn their older children not to put the toys in their mouths. Get rid of broken toys. Read the labeling and be sure the toy is appropriate for your child’s age. Register the product so you can be warned of any recalls. Notify the CPSC of any problems at saferproducts.gov. In addition to checking for broken parts and following age labels, the Toy Association has a few other safety tips on their list of recommendations. They suggest shopping at reputable retailers you know and trust. They will be selling products that have been tested and comply with the US Safety Standards. The Toy Association made particular mention of the risk of swallowing the batteries that come with the light-up spinners. They suggest parents only give their children spinners that have battery compartments that are secured so that only a tool or coin can access them. Fidget spinners aren’t necessarily dangerous, but like most thinks, they need to be used appropriately. Follow your common sense when it comes to whom you give these toys. Consider your children’s ages and if they’re still prone to putting things in their mouths. These toys can entertain for hours. Don’t spoil the fun!